“Woodman’s Pal” tool has been used by everyone from fire-fighting crews on up to Vietnam War-era grunts (where it was part of the standard issue survival kit). The secret to the Woodman’s Palis its incredible, high-carbon steel, and considerable heft. 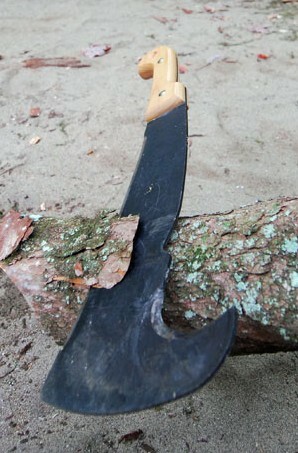 Machetes are often too lightweight to do more than bounce off a tree of any size, while axes are poor brush-clearers and often won’t hold much of an edge. The Woodman’s Pal, on the other hand, can keep an edge even after heavy use for years (seriously!) and has enough weight to hack through just about any tree under 6″ thick. We recently used a friend’s Woodman’s Pal on a camping trip to cut firewood into burnable sections. It performed essentially as well as a high-quality hand axe, while the bladed hook was useful for trimming branches and hacking our way through rubber-like rhododendron thickets. You can order the Woodman’s Pal from Cabelas, but the manufacturer’s website offers much more info on its history as well as some upgraded models. Have you used a Woodman’s Pal to survive in the wilderness — or shorten branches for trash pickup? Let us know in the Comments section!